If we can use one, and only one word to describe this season’s must-wear wedding jewels, it’s this: Color, with a capital C.
Brides-to-be across the globe are going gaga for precious stones in every hue of the rainbow. From Brides to The Knot, the powers-that-be in the wedding world have shouted their support for this colorfully gorgeous trend. Raymond Lee Jewelers is South Florida’s first and most trusted source for luxury pre-owned precious gems, and we’ve found a stone for every bride in love with both their groom and Roy G. Biv. Rubies are incredibly rare precious gems prized beyond diamonds in some cultures. The most desirable rubies are called “pigeon blood” rubies which, admittedly, is pretty gross, but the color of these stones is incomparable. Brides who wear rubies down the aisle are passionate, fiery and luxe. “The ruby definitely is something to smile about for its exquisite beauty when set as jewelry, and because the ruby also stands for peace and contentment.” – admirable attributes of any marriage. Topaz are the birthstone of the month of November and are famed for their amber hues, but they range in color from pink, yellow blue, peach, gold and even green. Like diamonds, topaz are graded by the 4 C’s, and are impossible to identify with the naked eye when compared to look-alike Citrine. Orange topaz represent constancy, loyalty, faithfulness and strength, making them an excellent choice for wedding-day jewels. Once thought to be inferior to just plain ol’ regular diamonds, the yellow diamond (or Fancy colored diamond) has quickly leveled the playing field with its crystal clear cousin. Celebs, perhaps most noticeably Mr. Gucci Mayne, have popularized fancy and intense colored yellow diamonds, leaving brides-to-be clamoring for this stunning, sunny rock. 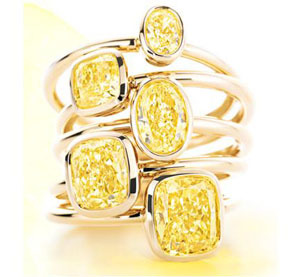 Tiffany & Co., in honor of their famous Tiffany Yellow Diamond jumped on this timeless yet trendy bandwagon with a slew of lovely yellow diamond jewelry. Vintage emerald, rose gold and diamond bracelet. With gorgeous deep green all over the runways this season, no stone is more Fall-ready than emerald. These gorgeous stones dazzle in pure green and shine with uniqueness. Emerald green is “…the colour of beauty and of constant love. In ancient Rome, green was the colour of Venus, the goddess of beauty and love…. Brides-to-be, are you planning on donning colorful jewels for the big day? Did your fiance gift you with a colorful engagement ring? Discuss in the comments below! Liz for Raymond Lee Jewelers, South Florida’s first choice for vintage and luxury pre-owned bridal jewelry. I have written blogs in the past extolling the virtues of our amazing watchmaker, Igor Polotsky. A man who through his extraordinary skills and quality of work has greatly expanded Raymond Lee Jewelers’ reputation as one of the best watch repair sites in Florida. His skills as a fully certified CW21 watchmaker have become so well known that one of Florida’s largest newspaper has written an article detailing the career of our watchmaker, Igor Polotsky. On Friday the 4th of February, The Orlando Sentinel wrote a terrific piece on Raymond Lee Jewelers’ own watchmaker entitled, Watchmaker Builds on Time-Honored Craft. The article tells of his rise from a 17 year old watch apprentice in Russia to the one of the most skilled and heavily certified watchmakers in the United States. Mr. Polotsky honed his skills in Moscow’s first watch factory and then in the late 80’s started to work for Tiffany & Co. Watch Repair. Raymond Lee Jewelers’ was lucky enough to have Mr. Polotsky join our team in 2009. Since his arrival at our store he has amassed a dedicated following of customers who only choose him for their watch repairs. Raymond Lee Jewelers is proud to have a staff that is truly the best of the best; we have two exceptional full time jewelers, a very experienced gemologist, a sales staff with decades of combined experience, highly trusted jewelry buyers and even one of the top buyers of luxury hand bags. Come into Raymond Lee Jewelers to see what all of South Florida AND Orlando has been raving about! This ring is the Tiffany & Co. Triple Roll Ring. This ring can be used for all occasions. It’s an extremely popular Tiffany & Co. ring. The ring is sterling silver. This could be a great present to yourself, or it could be a great present for someone special. This ring is for sale at Raymond Lee Jewelers for a very affordable price. Raymond Lee Jewelers is located in Boca Raton, Florida. If you are interested in this ring, call or go into the store! Her husband was also arrested and facing charges, too. They were trying to sell their fake jewelry on Ebay as well as private parties, online, and in mall kiosks. Tiffany and Co. came up with a lawsuit against Ebay for allowing this couple to sell fake jewelry posing as Tiffany jewelry. The court ruled in Ebay’s favor. Investigator’s think over 1,500 people purchased jewelry from these frauds thinking it was real. Want to purchase real Tiffany and Co. items? Come into Raymond Lee Jewelers today! Tiffany & Company is known for creating dazzling jewelry pieces that continue to look stylish and chic even decades after being released. Tiffany & Co. works with the worlds top jewelry designers in order to insure that this trend continues. One of its most celebrated designers is Paloma Picasso, whose first line was introduced in 1980. Her use of mixed colors and gemstones in bold, chunky designs was an instant hit. Her pieces often incorporate naturalistic elements such as the dove, use whimsical shapes, links and weaves and tend to showcase the color red. Sell jewelry. Paloma Picasso first started designing jewelry while working as a theatrical costumier in Paris and caught the attention of theater critics when she impulsively created rhinestone necklaces from gem-set bikinis. Realizing her talents she perused formal schooling in jewelry. Before coming to Tiffany & Co. she honed her skills as a designer at the House of Zolotas. It was there that her reputation as a expert jewelry designer spread through the jewelry industry and caught the attention of Tiffany’s Design Director John Loring. Mr. Loring decided to see Paloma’s skills first hand and invited her to present a table setting for one of Tiffany’s exhibitions. This one small presentation was all it took, a year later Paloma Picasso was introducing her first exclusive collection of jewelry for Tiffany & Co. Thirty years later and the world still can not enough of Paloma Picasso’s imaginative designs. O is for October and Opal! With the month of October now underway today I am bringing you a brief lesson in Gemology. Since the birthstones (that’s right there are two!) for October are Opal and Tourmaline. While this article is focused mainly on Opal I will follow up with a second article about Tourmaline shortly. Opals were revered by the ancient Romans as it was inspiring to them for its beauty was almost impossible to describe in words. Romans simply called it “Opalus” a word that means “precious stone”. 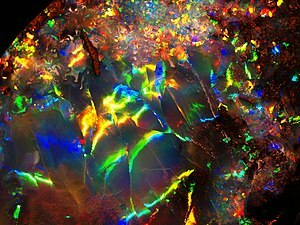 One philosopher and scholar Pliny described opals as “they equal the deepest and richest colors of painters. Others simulate the flaming fire of burning sulphur…and even the bright blaze of burning oil”. He was referring to Opals play of color ranging in colors as blue/green such as peacock feathers and vibrant reds and oranges like hot magma shooting out into the sky from a volcano. One of the greatest things about opal is that the range in varieties and colors make opal such a versatile stone. It ranges in color and qualities from the modestly priced white opals with a milky base color and soft play of color to intensely vivid black opals with color so intense it can look like it is on fire. The patterns of the opal’s play of color can be categorized in one of three types; Pinfire, Flash and Harlequin. Pinfire displays very small patches or “dots” of play of color, Flash displays large areas of play-of-color and Harlequin shows large, distinct angular patches of play-of-color with edges touching each other. Opals are found all over the world. White opals are the most common and are found in Ethiopia, Australia, and North and South America. Fire opals known for having their intense orange and red colors are most widely found in Mexico. Black opals are found almost exclusively in Australia. One of the main mining areas in Australia is Coober Pedy. The name comes from the aboriginal word “kupapiti” which literally means “white man in a hole”. Because of the hot nature of the Australian outback miners there often live in underground housing to escape the heat. With the current resurgence of victorian and vintage style jewelery designs, one cannot ignore the importance of opals in todays market. Usually opal jewelry is offered at a commercial level with small white opals and low play of color but finer quality opals are beyond beautiful. They have a rich glow to them that cannot be compared to by any other gem. 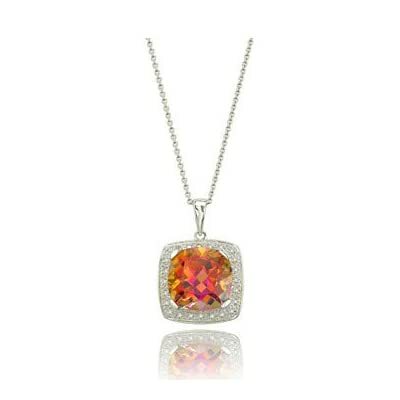 At Raymond Lee Jewelers we have a wide selection of opal jewelry of fine quality. Come in today to see our selection!.